I have not been so excited about a movie since The Phantom Menace came out. 300 comes out March 9th, 2007. I am assuming that 300 will not let me down like Menace did. 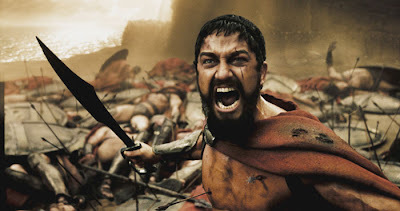 300 is a Frank Miller graphic novel turned major motion picture in the same style as Miller’s graphic novel, Sin City. I’d go into the detail of the historical significance, but I am bad at history and only average at determining awesomeness. I’m hoping my brother-in-law Tom is in town so we can go see the first showing. His whole family gets up for this type of event and I love being involved in their arguments of film style, CG and weapons fabrication. Have to check it out. One of my buddies came up with a list of criteria for a good movie he thought it had to contain at least 2-3 of the following.